The G06 has some unique features over the G05, which has been one of our flagship products here at GPS to GO. What really sets the G06 apart is its IOX technology for full ‘expandability’. What does expandability mean? Well, the G06 has a plug-in component that lets you connect all sorts of other devices, greatly ‘expanding’ its capabilities. For instance, you can connect it to a Garmin GPS for dispatching, an Iridium satellite for ultra-enhanced tracking, and not to mention various other sensors and controls. Intelligent In-Vehicle Driver Coaching: Manage your safe driving policies with comments from the device on your speed and idling time, as well as other corrective actions! 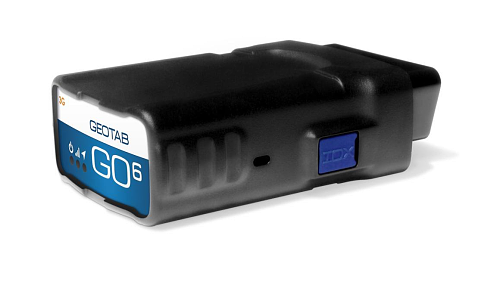 Ultra-Accurate Engine Diagnostics: It’s safe to say the Geotab GO6 device is the most comprehensive GPS vehicle tracking device in the world. The device is compatible with all kinds of vehicles, including hybrids, electric vehicles, delivery vans, and even highway trucks. Fastest Acquisition Time: Whether you park indoors or underground, you’ll be found as soon as you start driving. You’ll have second-by-second accuracy of ignition-on, trip distance and time, engine idling and speed. You’ll have time and address of arrival as well as accurate departure from sites visited during the day. Breakthrough Accident Detection & Notification: If a serious accident is detected, you’ll receive an email or desktop alert along with second-by-second data. You can immediately dispatch for help and manage all collisions from your central location. High Quality Recording: The G06 is exceptional in extracting valuable information on the health and running status of your vehicles in order to make you aware of service maintenance priorities. Recording VIN, odometer, seatbelt usage, and other information helps managers audit vehicle use and the safe driving habits of drivers. Interested in the G06 Device, or want to learn more about it? We’ll let you know exactly how its new features pan out as we use it more. But so far, we love it.